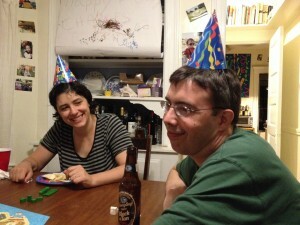 We had a mini-surprise party for Charles’s birthday. 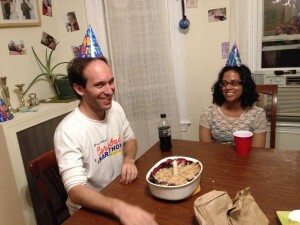 Charles prefers fruit desserts to cake, so instead of a birthday cake, I made a birthday blueberry crisp. This recipe from food.com is super simple. I think you could combine and swap different fruits in. I will add more lemon next time. Prepare an 11 x 7-inch baking dish (can use a 13 x 9-inch but it will not be as high). Spread the blueberries in the bottom of the prepared baking pan. In a small saucepan over medium heat combine the sugar, cornstarch, water and 2-3 Tbsp lemon juice; cook and stir until thick and clear, then add in the vanilla.Pour over, then gently stir in the cooked mixture with the blueberries. In a bowl combine the flour with oats, brown sugar and cinnamon. Add in the melted butter; mix until crumbly (I start mixing with a spoon then finish mixing with my hands). Sprinkle over the top of blueberries (there will be a couple of empty spots that is okay, there may seem like a lot of crumble but it will settle when baking). Bake for 30-35 minutes, or until blueberry mixture bubbles and the topping is brown. Serve with ice cream-- enjoy!